Drones are getting smarter and smarter these days, complete with every sophisticated AI to keep them from flying into electricity pylons and the like when you take it for a spin. So imagine how clever one of these flying contraptions would be with Intel tech inside it? Well, imagine no more as Chinese aircraft manufacturer Yuneec unveils the latest version of its sleek Typhoon, the Typhoon H. This powerful hexacopter comes complete with Intel's RealSense tech under the hood, enabling it to 'see' in 3D and have a sense of depth close to what we can perceive with the human eye. RealSense was unveiled by Intel a good two years ago, so it's intriguing to suddenly see the software and hardware combo used with a drone. 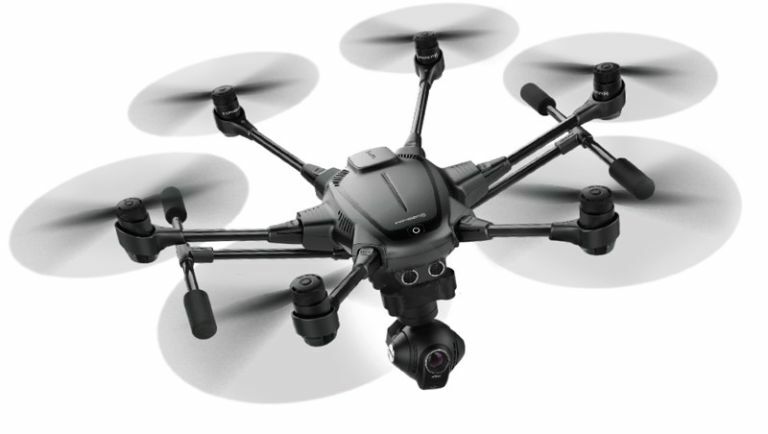 The drone can also capture images and footage in 1080p and 4K, and has an on-board face and gesture recognition system. Since it can 3D map both you in the foreground and the background behind you, you can even use its software to digitally swap said backdrop out for something funky or unusual. It may be a little more expensive than when it was first announced, but considering you'll also get that lovely 4K video, 12-megapixel still shots and a 7-inch Android-based controller there's at least decent justification for such a huge price tag. There's a good four week wait on pre-orders, so expect to get one in the post later in the year. Why not check out: Who needs humans when this drone launch system can work all by itself?